Voice revenue is declining due to threats from VoIP providers and free PC VoIP services like Skype. Data revenue is declining and bandwidth is becoming a commodity. Tradition large portals are attempting to deliver videos directly to the consumers using broadband providers’ IP networks, therefore relegating providers to being just a pipe. Broadband providers lose all the direct customer relationship with video subscribers. Cable providers are already in the middle of the making massive upgrades to their networks to provide Video-On-Demand (VOD) to their customers. In addition, cable providers are already starting to provide VoIP services over their cable broadband networks. Current broadband service providers and video content providers lack means to brand their own IPTV offering. Telco need IPTV revenue to retain current customers and get new ones. TELCOs need an IPTV system that’s easy to install and works over the Internet. TELCOs need an IPTV system that does not require a total network upgrade to support QoS. Complete IPTV solution that allows providers to deploy video portion of the “Triple Play” today. Complete flexibility in IPTV deployment based on bandwidth available: IMX IPTV solution supports HD streaming right over the Internet . This means ANY broadband provider can start an IPTV service even if they don’t own the physical IP network. Complete IPTV solution that supports the most advanced open standard video codecs such as H.264 or MPEG 4 Part 10. IPTV solution that can integrate with providers’ existing custom care and billing system. Number of Visitors – Customer would like to system to initially support up to 100K subscribers and with expandability to unlimited number of subscribers. HD VOD Video – Customer would like to offer HD 720p, HD 1080i and 1080p video content to premium customers. Customer is planning to add thousands hours of HD quality videos from all over the world. Streaming Over the IP without QoS – Customer’s IP network does not support QoS. However, customer has ADSL and ADSL 2+ connection to its subscriber base. Customer would like an IPTV system that can do streaming over this network. In addition, customer would like to offer IPTV services across the Internet to subscribers outside its customer base. Live TV – Customer would like to offer 50 channels of HD live TV and 100 channels of SD live TV for a total of 150 live TV broadcast channels. Video On 50″ HDTV – Customer is expecting subscribers to watch IPTV on their large screen HDTVs at home. Video quality must look good on large HDTVs. VoIP Friendly- IPTV system must be VoIP friendly. IPTV system must work simultaneously with VoIP traffic. Many existing subscribers already have VoIP services. Expandable – Customer would like an IPTV system that’s fully scalable to support their current requirements and future growth. Remote software/firmware update – Customer would like a system that has minimal truck roll. They would like to remotely manage all the PC and STB clients. TV BroadCast – Customer would like to stream all 50 broadcast IPTV channels right over the IP network. Viewing Ratio – Customer anticipates that at any given time, at least 20% of its subscribers will be watching videos simultaneously. Minimal Integration Cost – Customer does not have a large IT staff that can support a complicated IPTV deployment. Customer would like a system that will be easy to deploy, manage and support. 3 IMX M2200 IPTV middleware servers. 2 for management and another for redundancy. 25 IMX e4050 Quad SD Video Encoders to support up to 100 SD live TV channels. 50 IMX e4080 HD Video Encoders to support up to 50 HD live TV channels. 9 IMX X1i – Each server can support up 10,000 simultaneus streams or up to 100,000 users based 10:1 viewing ratio. 2nd IMX X1i also acts as redundant streaming server. 3 IMX X1i servers at each data center with total of 3 IPTV streaming server farms across the country. 9 IMX X1v VOD MatrixCast Streaming servers – Each IMX X1v VOD streaming server can support up to 10,000 simultaneous streams or up to 100,000 users based on 10:1 viewing ratio. 2nd IMX X1v is used for load balance as well as redundancy. 3 IMX X1v servers at each data center with total of 3 IPTV streaming server farms across the country. 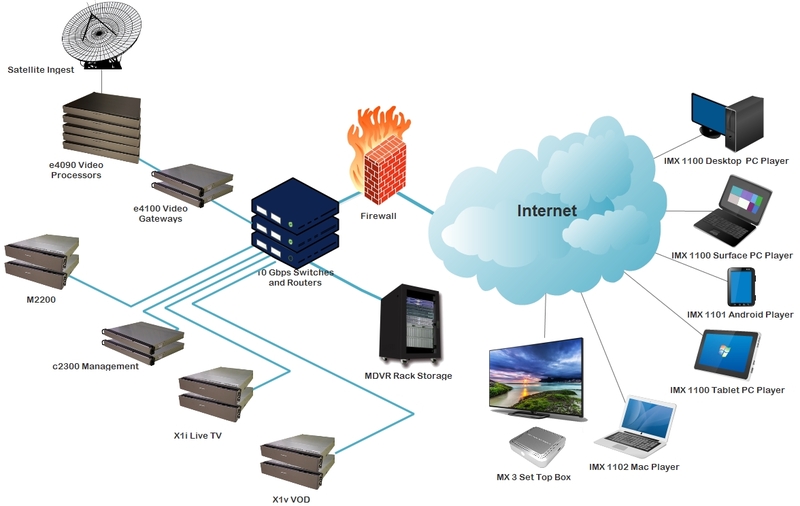 100,000 MX 3 IP STBs – Fully able to support HD 1080p videos. Subscribers need to get MX 1 IP STBs to watch IPTV on their HDTVs at home. Customized MX 1100 PC viewer with customer’s logo – PC clients will be made available to students for download off customer’s Website. Students can watch videos on their PCs. Customized MX 1101 Android viewer with customer’s logo – People with Android smart phones and tablets will be able to download customer’s own player right from Google Play store. Customized MX 1102 IOS Apple viewer with customer’s logo – People with Apple iPhones and iPads will be able to download customer’s own player right from Apple’s App store.